The Timber Rattlers and American National Bank present a Military Appreciation Series from July 1 through July 3. 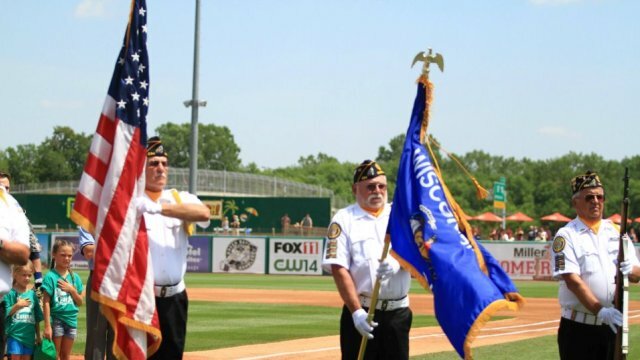 GRAND CHUTE, WI - The three games between the Wisconsin Timber Rattlers and Cedar Rapids Kernels at Neuroscience Group Field at Fox Cities Stadium from Tuesday, July 1 through Thursday, July 3 will have a distinctly military feel to them. The Timber Rattlers and American National Bank prepare you for your Independence Day celebrations with a Military Appreciation Series. Timber Rattlers players and coaches will wear jerseys with a military camouflage design during all three games of the series. Each of the jerseys will have a different military motto where the player name usually goes. The players and coaches will also wear patriotic caps during the series. There will be a silent auction for both the jerseys and the hats with proceeds to benefit the Fox Valley Veterans Council Emergency Fund. The silent auction will begin at 5:30pm on July 1 and conclude at the end of the seventh inning of the game on July 3. Fans may phone in bids for the military-themed jerseys by calling (800) WI-TIMBER or (920) 733-4152 from 9:00am to 2:00pm on July 2 and July 3. Bids for the silent auction on the hats must be made in person during the games. The Timber Rattlers are offering a free reserved bleacher seat to all active, reserve, and retired military personnel for all three games of this series. Please bring a valid military ID or form DD-214 to the box office to receive free admission to these games. Friends and family of the person receiving the free ticket may purchase additional reserved bleacher seat tickets at a discounted rate of $7.00 per ticket. Additionally, Boxkar will be performing a free concert outside the stadium before the game on Wednesday, July 2. All three games of the series are scheduled to begin at 7:05pm and the regular weekly promotions will be offered on their respective nights. These promotions include the Baker Tilly Business Person Special from WVBO and WNAM on Tuesday; WIXX Bang for Your Buck on Wednesday; and Arty's Old Fashioned Drinks Thirsty Thursday presented by 95.9 KISS-FM. American National Bank and the Timber Rattlers will also be giving away a Jim Henderson bobblehead on Tuesday, July 1. The first 1,000 fans to enter the stadium on that date will receive a bobblehead of Milwaukee Brewers pitcher Jim Henderson, the Timber Rattlers closer in 2009. There will also be a special Thursday night fireworks display on July 3, the final game of the series and of the homestand. Tickets for the Military Appreciation Series are available online, over the phone at (920) 733-4152 or (800) WI-TIMBER, or in person. The free ticket offer for military personnel is only available in person at the Box Office. The Neuroscience Group Field at Fox Cities Stadium Box Office is open from 9:00 am until 5:00 pm Monday through Friday and Saturdays from 10:00 am to 3:00pm.